WHAT ELSE CAN I EXPECT FROM AN ONLINE MBA IN ENTREPRENEURSHIP PROGRAM? The master of business administration, or MBA, is the most popular graduate program in the country. According to the National Center for Education Statistics (NCES), nearly 190,000 students earned MBAs in 2013-14; this number represents more than 25% of all master's degrees conferred during that academic year. MBA programs usually follow a comprehensive curriculum to prepare students for the various roles and responsibilities in corporate environments, but many allow students to earn a degree specialization in niche areas of business administration. An MBA in entrepreneurship will help you channel your creativity into effective business strategy. A popular specialization option for MBA students is entrepreneurship. This multidisciplinary field delves into the legal, ethical, financial, and logistical considerations for small business and startup creators. These programs also tackle strategies for attracting investors, securing suitable workspaces and facilities, recruiting talented employees, and working with other leaders in the local business community. Most entrepreneurship programs culminate with a capstone project, which allows students to create mock companies and address different areas of potential concern. Today, many students are choosing to earn their MBA in entrepreneurship online. Web-based students follow the same rigorous curriculum as their brick-and-mortar counterparts, leading to the same number of job opportunities after graduation. The asynchronous (or self-paced) schedule and study-from-home format are also ideal for students with part-time jobs, childcare obligations, and other responsibilities that interfere with campus-based learning. Learn more about what you can do with an online MBA in entrepreneurship and what kind of career opportunities you can look forward to in the field with this comprehensive guide. WILL AN ONLINE MBA IN ENTREPRENEURSHIP PROGRAM PROVIDE ME WITH THE SKILLS I NEED TO ADVANCE MY CAREER? Entrepreneurship programs equip students with the skills and knowledge needed to succeed in small business and/or startup management. The comprehensive coursework tackles key topics like budgeting and finance, human resources, supply chain management, and information technology. The best MBA in entrepreneurship programs also connect students with the local business community, allowing them to glean strategies and tricks of the trade from experienced small business and startup leaders. WILL AN ONLINE MBA IN ENTREPRENEURSHIP PROGRAM WORK WITH MY SCHEDULE? MBA online programs offer a flexible, easily accessible alternative to traditional college education. Students are able to download course lectures and readings, participate in virtual discussions with other students, submit written assignments, take exams, and communicate with their professors on their own schedule. Current technology also allows them to study away from home using a laptop, tablet, smartphone, and other portable Wi-Fi device. WHAT JOBS CAN I GET WITH MY MBA IN ENTREPRENEURSHIP? Most entrepreneurs enter the workforce prepared to launch small businesses or startups and serve in administrative or executive roles. Many MBA in entrepreneurship programs allow students to focus their studies on a particular industry, such as technology, marketing, business solutions, or healthcare services. Students who pursue these concentrations will be well-positioned for success in their specific niche of the job market. WHAT ARE THE BEST ONLINE MBA IN ENTREPRENEURSHIP PROGRAMS? Choosing a program is an incredibly personal decision, and only you can properly evaluate whether a target school's strengths match your educational needs. The following ranked list of schools should serve as a helpful starting point in your search for the best online MBA in entrepreneurship programs in the United States. If you are considering earning an online MBA in entrepreneurship, be sure to contact admissions specialists at different colleges and universities to learn more their about specific requirements and offerings. Established in 1853, UF has operated in Gainesville, Florida since 1906, and the school currently serves more than 50,000 students. UF’s online MBA in entrepreneurship program was founded in 1999, making it one of the oldest in the country. The program is highly respected, ranking among the best in the nation on lists from both the Financial Times and U.S. News and World Report. The MBA program at UF is exclusive, resulting in smaller class sizes and a more personalized approach that caters to individual student needs. UF offers both a two-year degree option, available to any student with an undergraduate degree, and a one-year intensive option, available to students with an undergraduate degree in business who have graduated within the last seven years. Students can choose a predominantly online format that requires just one weekend campus visit every four months. Advanced students who possess substantial management or leadership skills can choose the Executive track, which includes accelerated coursework and a focus on higher level business strategy. Occupying a 729-acre campus in the town of Chapel Hill, North Carolina, UNC is one of the oldest public colleges in the United States, first opening its doors to students in 1795. Students earning their MBA in entrepreneurship online at UNC gain the skills to actualize business ideas, from innovation and corporate strategy to new ventures discovery and technology management. Offering four start dates throughout the year, UNC’s MBA program emphasizes interactive learning, with most classes conducted through a video conferencing platform that mimics the classroom environment. MBA students can also take advantage of the school’s Global Immersion sessions. Students travel to different business centers worldwide and participate in collaborative learning with classmates, faculty, and other business leaders. Students are required to participate in at least two Immersion sessions of their choice throughout the program. For applicants who demonstrate significant academic achievement, work experience, leadership, or extracurricular activities, UNC offers several MBA fellowships that partially cover tuition costs. UT is the flagship school of the University of Texas System and one of the largest universities in the country, with an enrollment of over 50,000 students. Founded in 1881 in Austin, Texas, the school’s sprawling campus sits just a mile from the Texas State Capitol and is home to students from all 50 U.S. states and over 120 different countries. UT’s online MBA in entrepreneurship consistently ranks as one of the top programs both statewide and nationally, with U.S. News & World Report rating the school seventh in the country. Students in the program gain skills for leadership, including business ethics, effective communication, risk management, and global managerial perspectives. UT offers resources for students interested in entrepreneurship, including participation in the Venture Labs Investment Competition, a contest that simulates the challenges of soliciting startup funds from investors. Students able to travel to Austin can enjoy professional development opportunities such as summer internships, leadership seminars, and consulting projects. The flagship campus of the University of Illinois system, U of I sits on a massive 4,552-acre campus in the twin cities of Urbana and Champaign, about two hours south of Chicago. U of I is a highly respected institution, consistently ranked as one of the top 50 schools worldwide by publications including U.S. News & World Report. U of I’s online MBA entrepreneurship program features a flexible curriculum that allows students to design a degree that best meets their interests. Students take core business courses during the program’s first year, and the second year allows them to study elective courses through the school of business and other academic departments. U of I allows students to combine their MBA with any other master’s or PhD program at the school, allowing graduates to apply an informed business perspective to fields such as law, engineering, and architecture. Located about 20 miles north of downtown Dallas, UT Dallas is a selective public research university with an enrollment of more than 27,000 students. The Jindal School of Management (JSOM) is the largest of UT Dallas’ eight schools. The School’s highly ranked online MBA entrepreneurship program emphasizes skills for success in a global market, including analytical problem solving, strategic planning, team development, and effective communication. UT Dallas offers a concentration in Innovation and Entrepreneurship, preparing students for roles in creating new entrepreneurial ventures and positions in entrepreneurial finance, or innovation related positions in established companies, such as new product development or strategic marketing. Although students can complete a concentration in innovation and entrepreneurship entirely online, some innovation and entrepreneurship courses are only offered in a classroom setting. A wide array of support and extra-curricular activities are also available to students who can travel to Dallas, including UT Dallas’s Blackstone LaunchPad, the Venture Development Center (incubator), and multiple experiential courses, such as Startup Launch, The Entrepreneurial Experience, Social Entrepreneurship, and Seed Fund Support courses. The online MBA at UT Dallas can be completed within 24 months. The MBA program offers a flexible course schedule with multiple start dates throughout the year. Based out of Irvine, California, Brandman maintains more than 25 additional campuses throughout California and Washington state. The school serves a diverse body of nontraditional students, including military veterans and working adult learners. The online MBA in Entrepreneurship covers the critical principles of funding and marketing new kinds of goods and services, financial reporting, organizational dynamics, and human resource systems. Students gain strategies for idea generation and assessment, business plan writing, financing and resource procurement, start-up practices, and exit strategies. The degree also includes seminars in marketing research and new product development. Graduates of the program often find work in the nonprofit sector, particularly as fundraising managers, but the degree is applicable to other sectors of business. Brandman is regionally accredited, and the school’s online MBA program has been ranked highly by U.S. News & World Report since 2011. Syracuse, a private research university in Syracuse, New York, was established in 1831 by the Methodist Episcopal Church, but the school has identified as nonsectarian since the 1920s. The university is nationally recognized, winning high rankings from Forbes, Washington Monthly, and U.S. News & World Report. The online MBA from Syracuse’s Whitman School of Management, known as MBA@Syracuse, trains students in advanced practices of business analysis and decision-making, preparing them for advanced positions in a business environment. The Whitman School places a premium on practical experience, and students with five years of work or military service are not required to submit GMAT or GRE scores. The MBA program emphasizes skills necessary for generating business ideas and recognizing new opportunities, including feasibility analyses, entrepreneurial management, and the development of sustainable business models. The concentration requires students to take three elective courses in entrepreneurship, encompassing subjects in venture capital, corporate entrepreneurship and global innovation strategy. Students earning their online MBA with a specialization in entrepreneurship are prepared to assume leadership roles in startup companies, established businesses or social ventures. Located in the city of Fayetteville, UA is the flagship school of the University of Arkansas System, with a student body of more than 26,000. The university is nationally recognized, and UA’s college of business ranks as one of the top public business schools in the country. The MBA Entrepreneurship online program at UA can be completed within 24 months, and requires just one on-campus session each month. UA’s proximity to Wal-Mart’s corporate headquarters places the school at the heart of the retail industry, and the MBA program emphasizes studies in consumer goods and the value chain. Students can select the school’s Innovation and Entrepreneurship focus, which includes courses in strategic management and new venture development. The entrepreneurship track includes a Partnership Project, in which students gain hands on experience facing the challenges typical to managers in partnering firms. UMass sits on a 1,450-acre campus in the town of Amherst, about 90 miles from Boston. The school is home to more than 30,000 students and around 1,300 full-time faculty. UMass consistently ranks among the top public universities in the country. Its online MBA is ranked 12th among all programs in the nation and 10th among public universities according to U.S. News & World Report. The school’s online MBA in Entrepreneurship program caters to students interested in starting a business or revitalizing existing organizations. Students can satisfy the focus requirements by choosing from several elective courses, including Private Wealth Management, Social Media Strategy, and Negotiations Theory. UMass also offers several dual MBA/MS options for students interested in combining business and entrepreneurship principles with Management and Engineering, Sports Management, and Public Policy and Administration. While MBA courses are available fully online, dual MBA/MS courses may require campus visits. Founded in 1890 as an agricultural and mechanical college, OSU has grown into a major public research university, boasting an enrollment of more than 23,000 students. OSU is a longstanding proponent of distance education, and the school’s online MBA program dates back to 1999. U.S. News & World Report ranks the program among the top 30 in the country, and OSU also scores high marks for its friendliness to veterans. The online MBA entrepreneurship program emphasizes the principles, skills, and implementation issues related to creating businesses and other capital ventures. All students in the entrepreneurship track take Entrepreneurship & Venture Management and nine credits chosen from several elective courses. Elective courses include: Social Entrepreneurship, Emerging Enterprise Consulting, Commercializing New Technology, and Native American Entrepreneurship. Ranked among the top 100 public universities in the U.S., OSU is also known for its affordability and winning praise as a top value college from both Forbes and Kiplinger’s. Endicott was founded in 1939 as a women’s college in Beverly, Massachusetts. It became coeducational in 1994. Endicott is a smaller school with an enrollment of around 5,000 students, and its lower enrollment results in smaller class sizes. The school boasts a 13:1 student-teacher ratio, allowing for more significant support from faculty. The college strives for professional preparedness, and 90% of Endicott graduates find employment related to their major. The online MBA in Entrepreneurship emphasizes core studies in the areas of General Management, Marketing, Sales, and Finance. With six-week courses and flexible rolling start dates, the program is intended to accommodate a variety of learners, particularly those working full-time. The program’s Entrepreneurship concentration requires students to complete four related elective courses, including Family Business, Entrepreneurial Enterprise, Entrepreneurial Marketing, and Entrepreneurial Venture Finance. Course loads and scheduling are flexible; the degree can typically be completed within 18 months. UWF is a member of the State University System of Florida, and the school’s massive 1,600-acre campus makes it one of the largest in the state. Founded in 1963 in Pensacola, UWF has ranked as one of the best colleges in the Southeast according to the Princeton Review and as one of the best in the country according to Forbes. Best Master’s Programs has also ranked UWF as one of the most affordable colleges for online graduate degrees. The school’s online MBA in Entrepreneurship stresses experiential learning, with courses that allow students to build up a portfolio applicable to future employment. Students assume the perspective of a CEO, gaining practical skills in organizational management, marketing, and finance. The program features convenient seven-week course blocks, and the degree can typically be completed within 16 months. UWF allows business students to tailor studies to their industry of choice, giving them the opportunity to concentrate in entrepreneurship. A private liberal arts university located about 35 miles from downtown Los Angeles, CLU was established in 1959 by the Evangelical Lutheran Church, though the school is now nonsectarian. The 4,000 students at CLU come from around the United States and the world, representing more than 30 countries and a range of faiths. CLU offers a flexible, intensive online MBA entrepreneurship program that can typically be completed within 12 to 36 months of study. Easily customizable to suit individual student needs, the program features an entrepreneurship track that includes a required course in Innovative Business Models, along with several elective options, including Product Development, Entrepreneurial Marketing, and Growth Stage Venture Management. CLU emphasizes learning through experience, and the school offers many study abroad opportunities in China and Europe, allowing students to experience the world of international business firsthand. Students can make use of the school’s Career Services center to connect with internship opportunities at prestigious companies. WCUPA occupies a suburban campus in the borough of West Chester, Pennsylvania, about 25 miles west of Philadelphia. Founded in 1871, WCUPA is now a major regional university that serves over 16,000 students. U.S. News & World Report ranks WCUPA’s online MBA program 55th in the country, and the school itself ranks as one of the best educational values in the state of Pennsylvania. Students in the MBA entrepreneurship online program can also earn an Entrepreneurship Certificate, which covers fundamental concepts including Leadership, Industry Analysis Opportunity Recognition, and Target Market Analysis. Students who are able to travel to campus can participate in many events offered through the school’s Cottrell Entrepreneurial Leadership Center, including an entrepreneurship idea competition and the Global Entrepreneurship Week conference. Most students take courses part-time and complete the degree within two years; it’s possible to finish in nine months of full-time study. With a student body of more than 38,000, Temple is one of the largest universities in Pennsylvania, and its Philadelphia campus is home to 17 schools and colleges. The school’s online MBA in Entrepreneurship is one of the most respected in the country, with U.S. News & World Report ranking the program first in the nation for 2015 and 2016. Both The Economist and the Financial Times also laud the MBA as one of the best in the U.S. The program begins with a weeklong residency at the Temple campus, during which students complete preliminary coursework and network with peers. Aside from the initial residency, all program content can be completed entirely online. Temple stresses collaborative learning, and students can interact through live weekly classes using video conferencing technology. Courses are delivered in a flexible four-week format that allows students to easily fit in schoolwork around their career. UA is the oldest institution of higher learning in Arizona, tracing its origins back to 1885. With a student body of over 40,000, it’s also one of the largest colleges in the state, operating a main campus in Tucson along with distance education offerings. The online MBA entrepreneurship program at UA is highly prestigious, and U.S. News & World Report ranks it fifth in the nation among public schools. The program is targeted at working professionals, and a minimum of two to three years of relevant work experience is required for admission. Students gain an understanding of the fundamentals of innovation and entrepreneurship, learning to develop new venture ideas and devise unique strategies for business models, operations, and delivery methods. Courses are offered in an eight-week format, with six start dates throughout the year to accommodate students. With a full course load, the program can be completed within 14 months, but students have up to four years to finish their degree. A public research university in Muncie, Indiana, Ball State consistently ranks as one of the top colleges in the Midwest. The school embraces a spirit of entrepreneurial education, incorporating community organization and immersive learning into most aspects of its curriculum. Ball State maintains a nationally recognized Entrepreneurship Center, and the school’s experienced faculty win top marks from U.S. News & World Report, which ranks the program as the best online MBA in Entrepreneurship in Indiana. The Ball State MBA also ranks as one of the most cost effective programs in the country. Students in the program gain the skills to solve problems for both businesses and customers, including innovation in project management, opportunity recognition, and change management for businesses. The MBA’s entrepreneurship concentration includes three special elective courses, focusing on entrepreneurial strategy, the discovery of opportunity, and entrepreneurial planning and feasibility. The program emphasizes the practical application of learning, and students must successfully pitch a business startup idea to a panel of experts before being allowed to graduate. Affiliated with both the Concordia University System and the Lutheran Church Missouri Synod, CUW has offered a faith-centered liberal arts education for more than 125 years. Based in Mequon, Wisconsin, the school enrolls more than 8,000 students annually, with about a third of students entering from outside the state. CUW is a top regional university, and the school’s online MBA in Entrepreneurship is ranked as the best private program in Wisconsin by U.S. News & World Report. Students in the CUW MBA program complete core courses focusing on business ethics, leadership, organizational behavior, and corporate finance, along with 15 credits in Innovation and entrepreneurship studies. The program’s self-paced online courses range from 8 to 10 weeks in length, and the entire degree can typically be completed within 26 months. GMAT and GRE scores are not required for admission to the program, and a thesis is not required to graduate. Students complete a capstone course that demonstrates mastery of the program’s overall learning objectives. Founded in 1966, Bellevue is a private, non-profit university in Bellevue, Nebraska, intended primarily to educate working adults. The school’s online programs make distance education accessible to students of all backgrounds, and Washington Monthly ranks Bellevue among the top 10 schools in the country for adult learners. Relevant to both new and experienced business professionals, the online MBA Entrepreneurship program at Bellevue stresses skills of critical thinking, problem solving, and communication, along with the performance skills necessary for successful business leadership. The program’s Entrepreneurship concentration focuses on the design, launch, and growth of new business ventures, with emphasis on high-growth and socially-oriented ventures like technology. Designed for a quickly changing business world, the MBA also examines entrepreneurship from the perspectives of international business and sustainability. Students choose from a range of entrepreneurship electives, including Creativity and Innovation, Entrepreneurial Finance, and Small Business Operation. Founded in 1878 in affiliation with the Anabaptist Brethren Church, AU is a private, non-profit university rooted in Judeo-Christian values. Situated on a 135-acre campus in Ashland, Ohio, AU is a respected regional university, and the school receives high rankings from Washington Monthly, the Princeton Review and U.S. News & World Report for both its affordability and the quality of its academic programs. Ashland’s online MBA in Entrepreneurship covers the essential strategies for starting a business, with emphasis on building a startup in the state of Ohio. Students gain fundamental knowledge of business practices and entrepreneurship foundations such as idea generation, feasibility analysis, planning strategies, and funding options. In addition to the regular MBA curriculum, students take one required course, Entrepreneurship and Intrapreneurship, along with their choice of several electives, including Business Tax Planning, Small Business Management, and Business Information Systems. A Catholic-affiliated university in the Benedictine tradition, Benedictine is dedicated to values of scholarship, service, truth, and justice, offering education rooted in Catholic intellectualism. The school serves over 5,000 students from its main campus in Lisle, Illinois, a suburb of Chicago. The school offers an online MBA in Entrepreneurship and Managing Innovation, along with the several dual degree options, allowing students to combine their business degree with Public Health, Accountancy, and other majors. Benedictine offers a generous credit transfer policy, and graduate students can earn their MBA in under two years by transferring up to 32 credits toward the degree. Forbes has named Benedictine one of “America’s Top Colleges” every year since 2010, and the school’s MBA program ranks as one of the largest in the Chicago area. 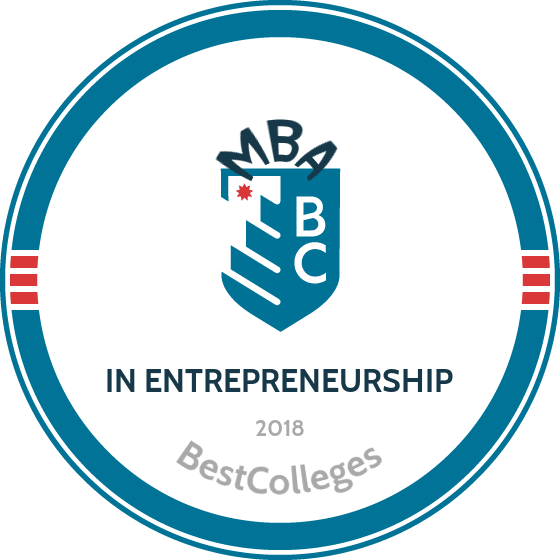 U.S. News & World Report also ranks Benedictine as one of the most ethnically diverse colleges in Illinois and lauds the MBA as one of the best online business programs for veterans. Based in Seattle, Washington, CityU enrolls students around the world through its comprehensive distance education programs. Serving more than 6,000 students worldwide, the school is a top online institution, receiving praise from both Forbes and U.S. News & World Report for its online degrees. The online MBA in Entrepreneurship program at CityU is nationally recognized, and the school also ranks as one of the top producers of MBAs in Washington State. Emphasizing entrepreneurship from both an operational and financial perspective, the program covers topics such as concept vetting, business plan development, startup marketing, risk management, and exit strategies. The program’s Entrepreneurship emphasis requires students to take four elective courses, including Innovation Strategy and New Venture Implementation. CityU offers a language-assisted MBA option for students who are English language learners. Students enroll in English proficiency courses to improve their academic and professional language abilities. A Christian liberal arts college in Mechanicsburg, Pennsylvania (about 12 miles from the state capitol Harrisburg), Messiah offers comprehensive education grounded in Christian faith, encouraging values of service, leadership, and reconciliation. Founded in 1909, the college now serves more than 3,000 students of various Christian denominations. Keeping with the school’s mission, the online MBA Entrepreneurship program at Messiah focuses on ethical leadership and management skills that benefit employees and community members. The program offers an emphasis in Social Entrepreneurship, equipping students with the skills to start businesses that address societal challenges through effective, community-centered, operational practices. The online degree features 8-week courses along with customizable field projects that allow students to gain hands-on business experience in their own community. Typically completed in two years, the degree culminates in an integrated capstone course that requires students to combine business theory and practice, demonstrating their understanding of the program’s guiding principles. One of the oldest universities in Chicago, NLU has maintained a reputation as one of the most progressive and diverse colleges in the Midwest, educating students of all ages and backgrounds. Founded in 1886, the school now serves more 4,700 students worldwide through six campuses and online programs. Students can take the school’s online MBA in entrepreneurship entirely online or blended with occasional campus meetings every other week at the main Chicago campus, or once per term at its Florida campus. The MBA emphasizes authentic leadership, combining traditional education strategies with an individualized approach tailored to student’s unique strengths. Rooted in practical experience, the program ends with a capstone project where students work together to run a simulated company. Program graduates become effective advocates for organizational change, knowledgeable in communication, teamwork, and ethical responsibility. William Woods University is a small private college located in Fulton, Missouri. The school employs a learning model that emphasizes hands-on and service-learning opportunities. Online options include a 30-credit master of business administration in entrepreneurial leadership, which is accredited by the Accreditation Council for Business Schools and Programs. Coursework in the online MBA includes accounting, business law, management principles, organizational theory, and information systems. The entrepreneurial leadership concentration prepares business professionals to harness human capital and financial resources to accomplish goals in a competitive global market. As part of an applied case project, students complete a business plan, which they defend in front of a panel of business experts. Students can complete the degree in two years. Tuition remains the same for the duration of continuous enrollment. Admission requirements include a bachelor's degree; a minimum 2.5 GPA; and prerequisite accounting, economics, and finance courses. The employment outlook for entrepreneurs has greatly improved since the recent recession came to an end. During the recession's lowest point in 2010, 560,588 businesses were less than one year old; five years later, this number has risen to 679,072 -- an increase of more than 21%, including an 8% spike since 2013. Entrepreneurs created roughly 2.5 million jobs in 2010; in 2015 they created more than three million. In terms of job placement, the unemployment rate for entrepreneurs depends largely on their specific job title. The following table features unemployment rates for 10 of the top careers for professional entrepreneurs. All 10 professions listed on the table were included on the Best Business Jobs list published by U.S. News & World Report in 2016. As the table shows, the best positions for entrepreneurs in terms of job outlook include roles in fundraising, financial, market research and management analysis, financial management and human resources. Comparatively, the unemployment rate for all but one of these occupations is lower than the national unemployment rate for all industries, which is currently 4.6%. In addition to more favorable job placement rates, graduates with an MBA in entrepreneurship also enjoy relatively high earning potential. According to the 2015-16 PayScale College Salary Report, those who graduate with an MBA in entrepreneurship earn median annual salaries of $70,300 during their first five years and $139,000 after a decade in the workforce. The table below compares these salary figures against the expected earnings of MBA recipients in other managerial fields. As the table indicates, entrepreneurship ranked second behind 'general and strategic management' in terms of mid-career MBA earnings. Entrepreneurship also ranked first among these fields of study in terms of salary growth, with a 97.7% increase during the first 10 years alone. Your specific field of study in an MBA program can also have an impact on your career earnings, although salary growth rates will primarily depend on your job title and role within your company. The next table uses PayScale data to explore career salary projections for five of the most common occupational roles for MBA in entrepreneurship degree-holders. As the table indicates, salary projections vary considerably for different entrepreneurial job titles. All five occupations on the table experienced at least 27% salary growth. Marketing directors, who earn the fourth-highest salary at all four benchmarks, actually reported the highest rate of salary growth, a 97% increase between entry-level and late-career positions. Business development directors placed second with 71.5% growth, followed by chief financial officers (CFOs) with 56.8% growth. Students who graduate with an MBA in entrepreneurship will be qualified for dozens of top-level positions, although your eligibility for specific roles will depend on additional factors like a company's size and your location. Below, we've covered four of the most common career pathways in healthcare management. Top Executives: This broad category includes chief executive officers (CEOs), chief financial officers (CFOs), general and operations managers, and other top-level personnel. Together these individuals develop budgets, organizational goals, hiring needs, and other key company strategies. They then use a range of metrics to evaluate overall productivity and performance. Administrative Services Managers: These managers oversee the various administrative services at their company or organization, including logistics, technology support and workplace compliance. In many small businesses and startups, all administrative services may be handled by a single manager. Human Resources Managers: Human resources managers (also known as HR managers) oversee the staffing and recruitment needs of their company or organization. Their day-to-day job duties may include writing job vacancy descriptions, interviewing and screening candidates, hiring new employees, and coordinating orientation programs. HR managers play a key role in small businesses and startups that have moved beyond the initial development phase and are in need of talented, reliable employees. Sales Managers: These managers lead the sales teams at their company or organization. The work with executives to create sales objectives and then monitor employees to ensure these objectives are reached. They also develop sales training programs and coordinate professional development opportunities for sales personnel. Making professional connections and learning as much as you can about entrepreneurship is crucial to your professional success. Professional organizations offer a great entry point for students who want to learn more about their chosen career path. Below, you'll find three of the country's most prominent organizations established for entrepreneurs. These organizations host networking events, provide online trainings, maintain active job boards, and offer other services for career-ready college graduates. Entrepreneurs' Organization: Established in 1987, EO is considered “the world's only peer-to-peer network exclusively for entrepreneurs.” The network includes more than 12,000 entrepreneurs and business owners, and members receive one-on-one mentoring services from established professionals. Collegiate Entrepreneurs' Organization: CEO serves members in 250 different collegiate chapters in all 50 states. Three affordable membership options are available, and member benefits include invitations to student-only entrepreneur competitions, reduced entrance fees for CEO events, and free webinars and professional development courses.